Come out to Blake Farms and Blake's Hard Cider Co. on February 9th from 1:00pm - 4:00pm for a full day of live music, award-winning chili, craft beverages and a fun filled day! Your ticket will include a logo pint can glass a pint of hard cider or beer (not included in the DD ticket) and UNLIMITED CHILI!!!!!!!!! Categories of chili to taste and vote on are 4 legged, 2-legged (chicken, duck, etc. ), exotic, and no legged (vegetarian). Chili will be served promptly from 1:00pm-3:30pm. Judging & Winners announced AT 4:00pm in the Apple Barn! 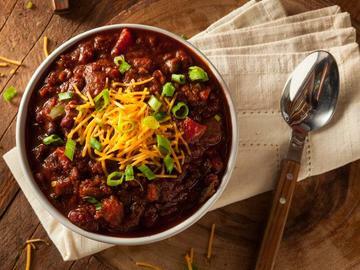 SIGN UP TO BE A CHILI COOKER! Each cooker will receive a commemorative t-shirt! Please prepare at least 2 crock pots of chili to serve- estimated attendance is 500 people! The more you bring for others to taste, the better your chances are! Chili entries need to be on site promptly at 11:00am on the day of the event. Prizes for each category winner & overall grand prize winner! Per health department regulations chili will be required to be heated to 165 degrees to serve.